We are so thankful to our supporters for helping us raising awareness for the kitties we rescue and helping us find forever homes! 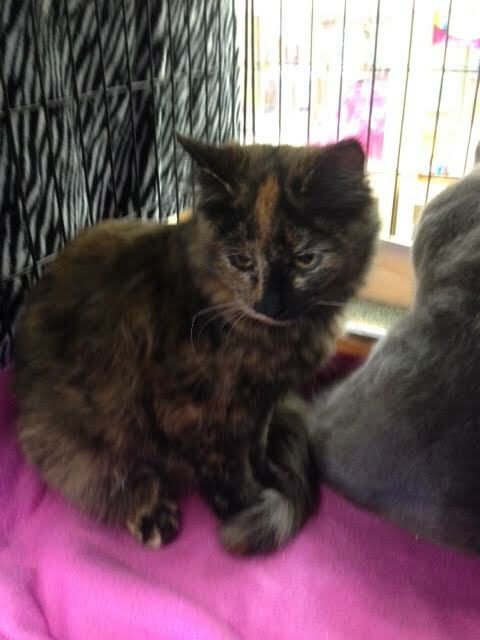 AUGUSTINA & her brother SEBASTIAN (aka Tortie Boy) got adopted together! Their new mama is so amazing! A true cat lover and waited to find the perfect pair! We are so happy for these two and their new family! Rescued within months of each other, Augustina and her brother hadn't had a chance to meet each other prior to their adoption as Sebastian was in the cat haven room at his foster home working on socialization (very shy but very sweet boy) and Augustina didn't want to go play in the cat room. They both have bonded and snuggled together their first night in their new home. We know they will become best buddies and so glad they were reunited! 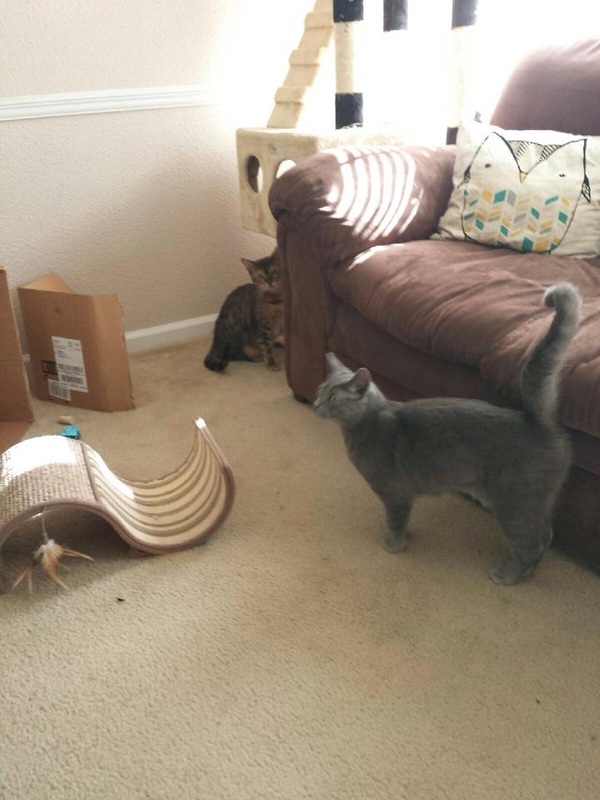 ROCKI was adopted by his foster family, and co-founders of Sparkle Cat Rescue! Originally an HSAC kitty, he was transferred over to Sparkle Cat Rescue when we formed. He had been in our foster care his entire life. 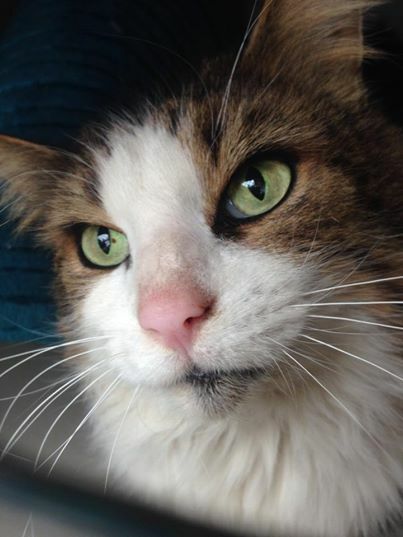 He has been a special kitty and we just couldn't bear the thought of him not receiving all the love and care he will need in the future. At the time of adoption he is still under a year old and doesn't have the same energy other cats his age do. He will require special attention to ensure he eats well and gets the medical care he might require in the future. He is a true miracle. TINSEL went to her new home for a trial run to see how she would do with her new moms and her new siblings! After a week of trying things out she is doing pretty good. She is quite a little mouthy, pouty and very lovable girl! Her new name is Miesha! Rescued in November after we received a call she needed to be rescued from under a house, she walked right up to us and into a carrier and was quiet as a mouse, very thankful to be on her way to regular meals and a warm bed to sleep in. Within a week of her rescue she went into heat so that was really cutting it close for her to have kitties that would be homeless like her. Now she has a wonderful home and will be loved for the rest of her life! Brother & Sister, SPENCE & HAVAH are discovered to have medical issues that will require surgery in the near future. Our mama was part of a feral cat colony that was being TNR'd (trap neuter released) only to find out her pregnancy was too far along. Two weeks later mama gave birth to 6 kittens. We were kept inside with our mama but she ran out of milk. We then were taken in by our foster mama and nursed back to health. Our 4 brothers and sisters all found great homes and are healthy. When our siblings were adopted we were thriving and enjoying life as healthy kittens. 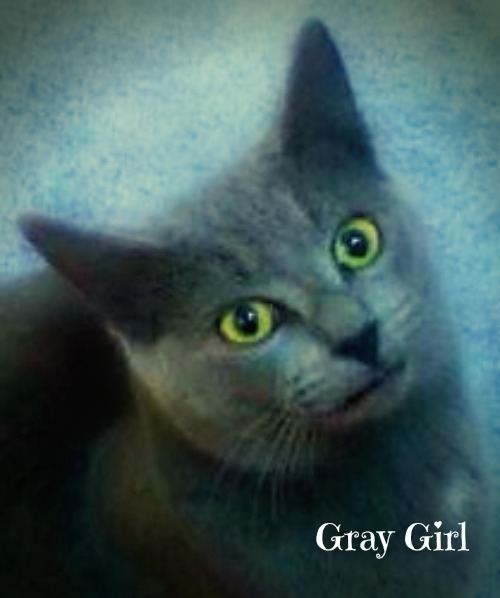 Sparkle Cat Rescue took us into their program in October 2014 and we've attended a few adoption fairs. A couple of months ago Havah developed a limp in her hind leg and became less active. Two weeks after that Spence developed a severe limp in the same leg and became inactive. Havah has been x-rayed and was diagnosed with stage 3 bilateral luxating patellas, meaning she has knee caps on the side of her legs that pop in and out. The vet says without surgery She will develop severe arthritis and painful bone spurs. With surgery she can live a normal pain free life and be able to run and jump again. Her surgery is estimated to be $2000. Spence is scheduled to be x-rayed on February 23, 2015 and we are prepared to receive the same diagnosis and cost of surgery for him as well. Once we receive an estimate for the surgery, we will start a Fundrazr to help raise funds for their surgery. Without the support and donations from our supporters, this will put quite a big dent in Sparkle Cat Rescue's funds available for current and future kitties we rescue. 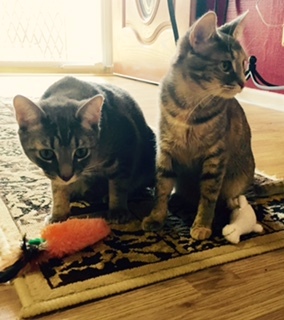 BABE & DOLL were adopted today! 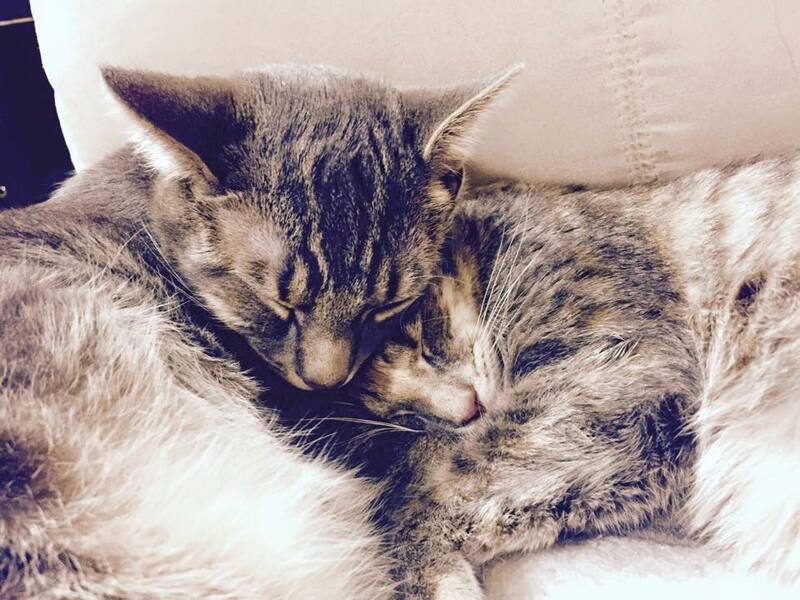 Their mom is so happy to have this brother & sister pair! She named them (her husband always called her Babe & Doll). We think it's so sweet and we are so happy for these babies! They are being spoiled rotten! JOSEPHINE joined us on Thursday, February 19, 2015. 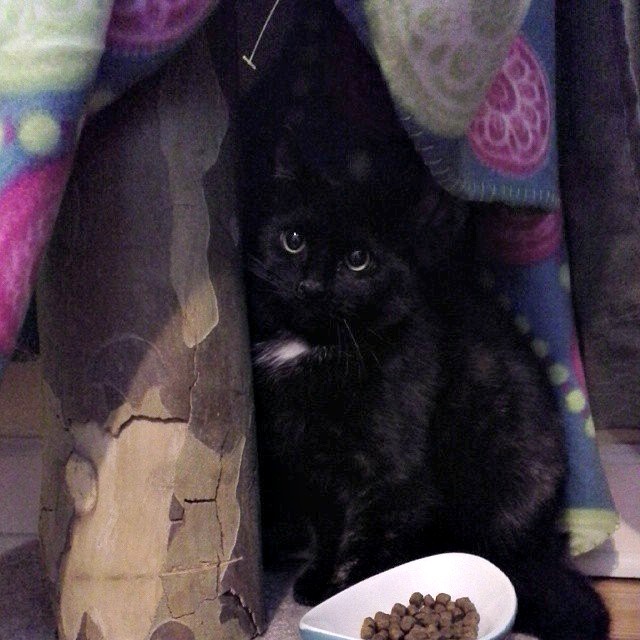 She was rescued a few weeks ago and taken to our vet partner for spay and at that time it wasn't believe she would be a good indoor kitty and she was on her way back to an outdoor live. However after surgery she proved to be a loving, playful girl. We are thrilled to have her with us. She loves all the other kitties in her foster home and acclimated very quickly. She has been combo tested (negative) and is up to date on her vaccines. We hope she finds her forever loving home soon! 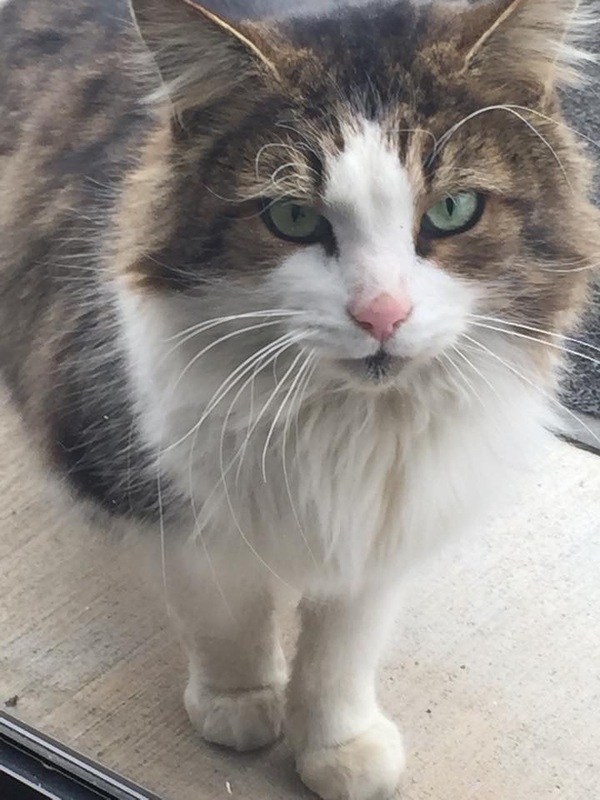 This sweet mature big boy (above) nicknamed 'Bushy Tail' and newly named NOAH was rescued after we received a call from a local business in Burlington NC that he was trying to get in the office out of the cold and begging for love and attention. We went to get him but he had hunkered down somewhere so we left our carrier as we were told he was very friendly. 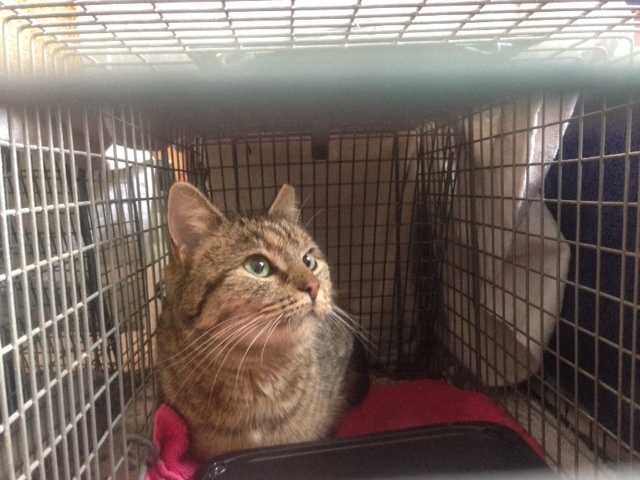 About an hour later, the call came that he was in the carrier ready for us to bring him back to our cat haven room to receive all the TLC he desires. We posted him with the local shelter, on Facebook on Lost & Found pages. No one stepped forward to claim him within the 72 hour required hold period. He is a big sweetheart, and was so exhausted when he finally got settled into a large dog crate we've set up for him to be isolated in while we wait to get him vetted. He appears to be older but really unsure of his age. He just is so grateful to be inside out of the cold and away from sleeping in sewer pipes like he has been for the last month. Big boy being transported to safety & warmth. Big boy finally getting the sleep and rest he needs. PEPE's foster family fell madly in love with her and decided to make her an official member of their family on 2/14/15! We are so happy for this girl. She will continue to share her sparkle with fosters in her home! (NOVA) has been adopted and has a wonderful new brother, LEO. It didn't take long for Nova to settle in. She loves playing with her new brother Leo! 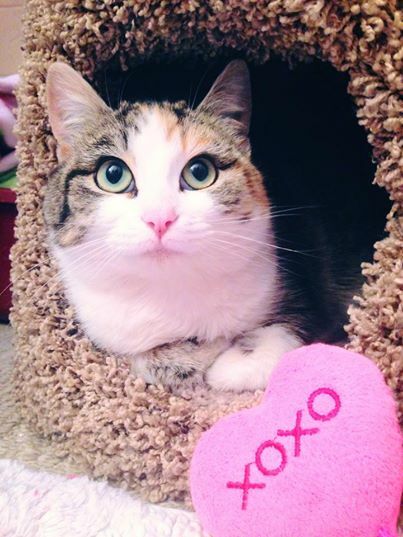 MIMI (we called her Meemers) was adopted by a wonderful new mama, Avery, on 2/11/15! These two hit it off at the adoption fair and we knew they were meant to be! 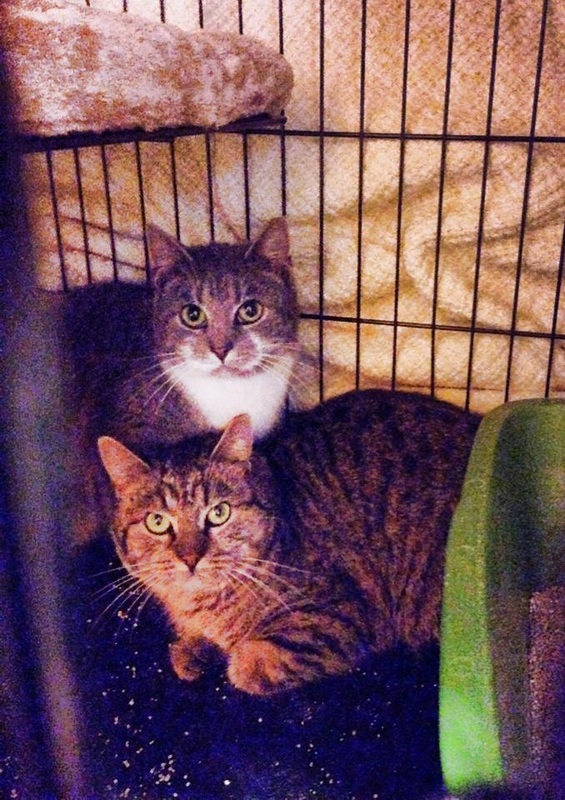 INGRID & ISABELLA (Mother and daughter below) were trapped by FCAP on 2/7/15 and taken to FCAP (Feral Cat Assistance Program) in Greensboro on Sunday for their Spay Day. These two are such sweet girls that we are working with socializing them. Mother is about 2-3 years old, and daughter born Summer of '14. They will be in foster care getting much needed socialization to prepare them for their future indoor homes. Mama is a beautiful tabby and baby girl is tri-color. Sweet and adorable SPARKS found the most amazing mama in the world at our first adoption fair of February! He is going to be one spoiled baby! Sparks was found randomly in December when someone was out dumpster diving at the Walmart in Chapel Hill and found Sparks taped shut in a box! Sparks was only 6 weeks old at that time. At that time he was taken to someone who could take care of him and try to find him a home. Sparkle Cat Rescue learned about him and took him into our program in early January. This boy is so lucky and most definitely would have been crushed to death had he not been rescued. Happy Tails to our amazing boy! KITTY SOFT PAWS was rescued in late January/early February. She is declawed on her front paws and had an injury to a claw on her back paw. She is a gorgeous blue Russian girl. We took her in the program and her spay is set for 2/23/15. She is with her rescuers, now our new fosters. She has been a little timid around other animals but she is learning. 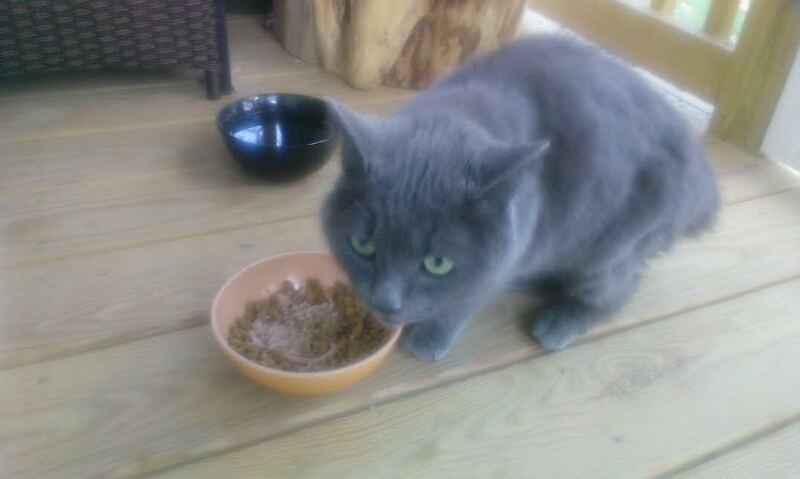 She is very sweet and loving with her humans.. She is a bobtail, but it is not believed she was born this way. 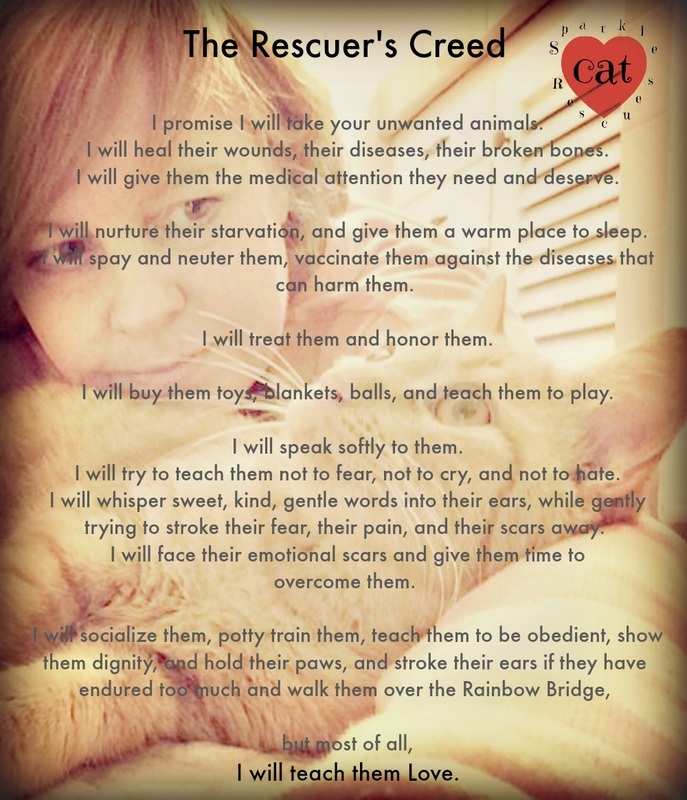 ﻿This is the year I will be turning 50 and the greatest gift of all would be the gift of support for Sparkle Cat Rescue. Support can be in the form of donations, sharing, volunteering, fostering, and spreading our mission. I have set up a FIVE or FIFTY CHALLENGE on Fundrazr in honor of my birthday, which is March 4.